— Today is Saint Meinrad's day. This post is going to be a bit of an uphill struggle, clearly. You are just going to have to pay close attention. Saint Meinrad was born sometime after 790 in Sülchgau (between Rottenburg and Tübingen) in Swabia. In Old German his name was Meginrath (or Meginrat or Meginrad). It is assumed that his parents were local nobility, but from about the 16th century his rank has been amplified, on the basis of no evidence whatsoever. As so often in our dealings with the early saints –videLucy and Barbara– we have no contemporary evidence to go on. The earliest biography of Meinrad was written several decades after his death. As the years went by more details were added to Meinrad's biography, but with ever decreasing credibility. Let's concentrate on what we think we know. Meinrad was sent at a young age to the monastery school of the Abbey of Reichenau on Reichenau Island, close to Constance in southern Germany. He distinguished himself in his studies, became a priest shortly after he was 25 years old and was then sent as a teacher to a small monastery at Benken in what is now Switzerland (Canton St Gallen). The teaching didn't last long. 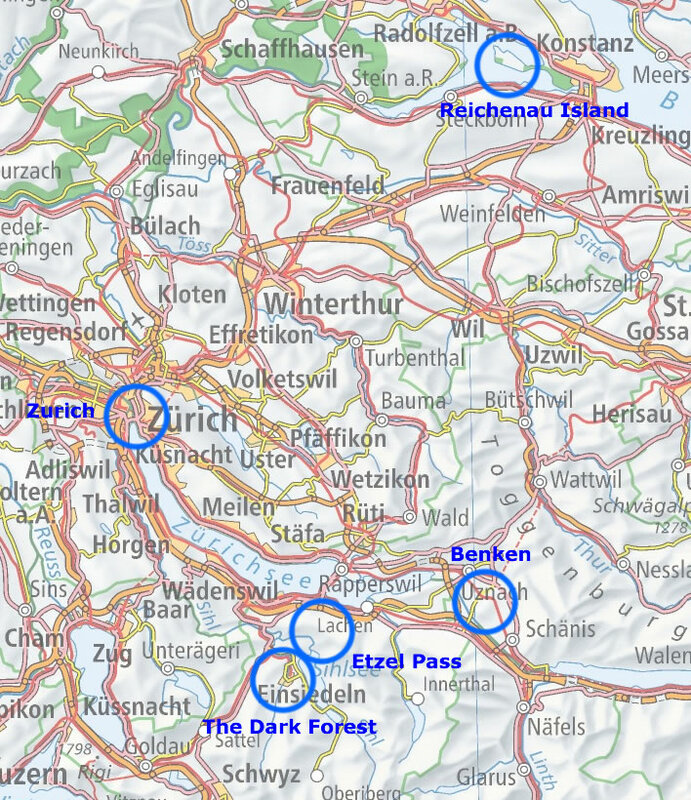 Around 828 he withdrew to a cell on the Etzel Pass (the road from the lower part of the Lake of Zurich into Canton Schwyz) to live as a hermit. Anyone who has ever been a teacher will understand his motivation completely. Even before that route became one of the major pilgrim tracks on the 'Way of Saint James' to Santiago de Compostela it was a popular pass route. In order to get away from the traffic and retreat even further from everyday life in 835 he established a cell in the finsterer Wald, the 'Dark Forest', in the area in which the present abbey of Einsiedeln stands. He lived there for 26 years, becoming famous in the region for his ascetic life. Meinrad's hermitages. 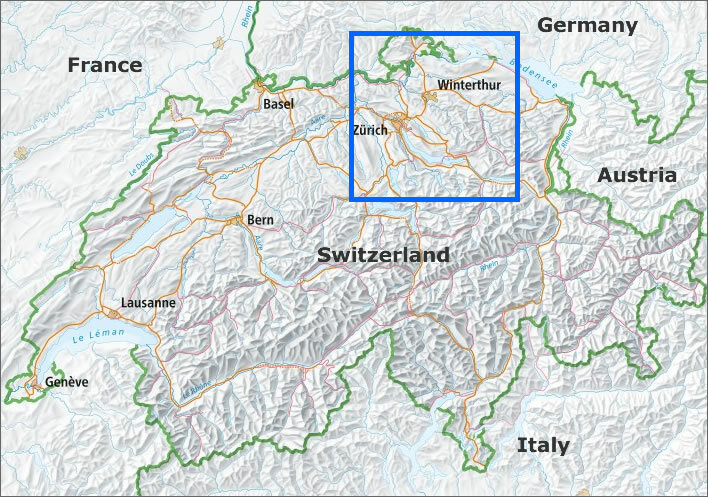 Blue rectangle top: the Etzel Pass. The red hollow lines are the ancient tracks in the area. Blue rectangle bottom: the Abbey in Einsiedeld, in Meinrad's time 'the dark forest'. Image: Base map ©www.ivs.admin.ch. We are not big fans of ascetics on this website. It may be very admirable living from hand to mouth, in continual hunger and uncertainty, freezing cold in winter and at times depending on whatever you can find in the woods and whatever some devout pilgrim donates in passing, but it is a life based on monumental egotism in the service of the salvation of the single individual's soul. There is no economic or cultural contribution to the lives of others, so on the whole we are not too bothered about the pointless lives and deaths of such people. Except, in Meinrad's case, this renowned bag of bones squatting in a hut in the forest came to a bad end. On 21 January 861 (1157 years ago today) two robbers came to call. It was the practice for those who visited a hermit to bring him some present for his shrine. Meinrad gave them his hospitality, offering them wine and bread, but when he made it clear to them that he saw their true intentions were to steal from the shrine they beat him to death with clubs. His body was taken to the abbey on Reichenau Island and interred there. 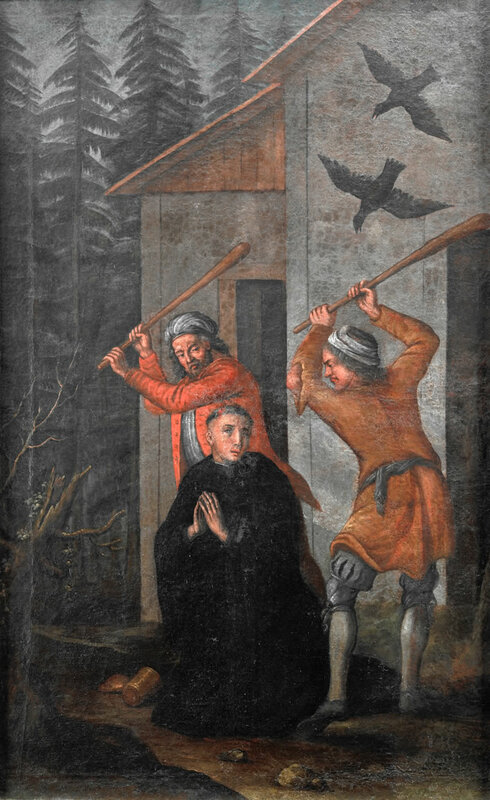 Meinrad being murdered by the two robbers. Oil on canvas. Second half of the 18th century. 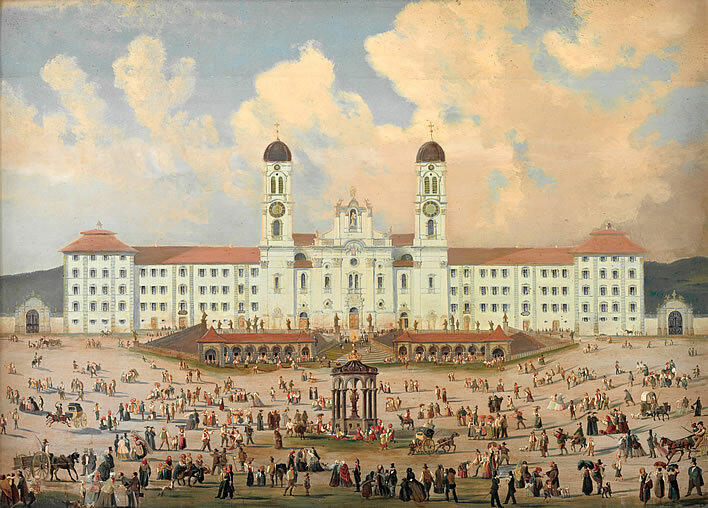 Image: Kloster Einsiedeln, Kunstsammlung. Photograph: Schweizerisches Nationalmuseum. He seems to have come to be regarded as a saint almost immediately after his death. With not a little irony, Meinrad, the Benedictine hermit who fled as far as he could from the world and who was murdered by his visitors, became the patron saint of hospitality. Only hagiographers can think up such connections. His cell in the dark forest continued to be occupied by successor hermits. Seventy-three years after his murder, in 934, the Abbey of Einsiedeln was founded on the spot where his cell had stood. More precisely, the Gnadenkapelle, the Chapel of Our Lady within the basilica marks the spot. His relics were brought from Reichenau to Einsiedeln in 1039 and his head is in a drawer of the main altar in the church. This afternoon at four-thirty Einsiedeln time, the head, in its silver box, will be taken for a little walk from its drawer in the main altar to the Chapel of Our Lady and back. As a result of the increased veneration of him, at the site of Meinrad's first cell on the Etzelpass a chapel dedicated to him was built sometime before the 13th century, then rebuilt in 1698. So much for the (sort of) historical record. Meinrad's biography, characteristically for all hagiography, was pepped up by some picturesque details invented and added on as time went by. Thanks to this mythmaking we now know that one of his murderers was called Richard and came from what is now south Germany, the other was called Peter and came from what is now Graubünden in Switzerland. Meinrad had raised and fed two ravens. We don't know their names unfortunately. After the deed the murderers fled, but were followed all the way to Zurich by Meinrad's two pet ravens. The ravens drew attention to the robbers, who were arrested, tried and found guilty. Things were just so much simpler before CCTV. What happened to the robbers depends on which account you read, most have them burnt at the stake or beheaded. It seems to trouble true believers little that, if the raven story is true, two men were put to death in one gruesome way or another on the word of two ravens. It is one more historical irony that the least credible part of Meinrad's biography, the two ravens, became his symbol, which is now used by the Abbey and the town of Einsiedeln on their respective coats of arms. Some time ago we noted the two ravens that were shown in Hans Erni's representation of the Abbey of Einsiedeln in his mural for the Swiss National Exhibition of 1939. News comes today, too, that Meinrad's life has just been turned into a comic book in the style of Asterix. We make no further comment, only noting that it will fly off the shelves in the very busy pilgrimage season in Einsiedeln. We can't imagine what Meinrad the ascetic would make of all this, his head safe in its drawer save for its annual outing around the abbey. European locator map. 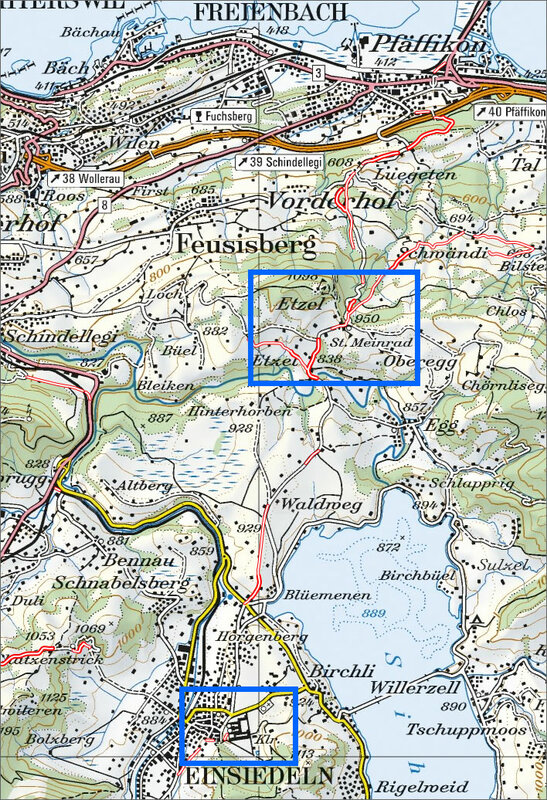 Image: Base map ©www.ivs.admin.ch.